My journey of becoming a stay-at-home mom was tougher than I expected. After a short maternity break, I went back to work for several months while my husband finished his undergraduate degree. Then we moved to a new city where he began dental school and I began being at home with our son. The first weeks were filled with organizing and making our new apartment feel like home, but the days turned into weeks where often my only adult interaction was talking to the check-out clerk at Target. Admittedly, I didn’t help myself out much in the beginning–feeling too nervous or shy, I found silly excuses not to attend the few things I was invited to. I longed for the friends I had left behind. The ones who already knew me understood my quirks and liked me anyways. It was hard to stay in touch and I felt disconnected from them. I was lonely and started to resent that my husband “got” to be at school all day. I quickly realized that if I was going to survive this stay-at-home-mom gig I needed a community of friends and for the first time in my life it was going to require a real concentrated effort on my part. So I sat down, gave myself a pep talk and made a game plan for how I could be a better friend–both to those I have known for years as well those I might meet in my new stage of life. People like talking about themselves and nothing feels better than feeling like someone else is genuinely interested in you. Find out what their story is. What do you have in common? What are they passionate about? What is worrying them? In order to find these things out you have to ask them and then really listen to what they say. Start with small talk, and work from there. When a friend tells you about something happening in their life, the next time you see them, follow up and ask. “How is your Dad doing after his surgery?” “Did you ever figure out a great way to organize all your pictures?” “Have you found a dress for your brother’s wedding yet?” Remembering what they have going on in their life and following up with them goes a long way. If you think something nice, why not say it?! Learn how to give compliments and say something nice. Even if you didn’t give a compliment the moment you thought about it, you can take a minute to write a note after the fact. There is something magical that happens in friendships when you are vulnerable enough to invite them into your sanctuary. Yes, it can sometimes be scary, but do it anyway. Invite them and their spouse or family over for dessert or a game night. Host a favorite things party or girls get together. Don’t wait for your house to be perfectly decorated and clean. Let them see you are real and genuine. Have you ever wished you would have stayed in touch with someone but feel it’s too late now? It’s actually not too late. Ask yourself, “would I think it was weird for them to sincerely reach out to me after all this time?” Usually, that answer is no, you would be thrilled. Break the mindset barrier that says once you’ve lost touch it’s over and just reach out. Birthdays, graduations, new babies…celebrate with your friends. Whether you are near or far or they invite you to join in the formal festivities or not, write a card or buy a small gift to acknowledge their milestones and life events. Even a simple heartfelt email or birthday message can go a long way in helping your friends know you care for them. Keeping in touch with friends who live hours away is tough. But if it’s important to you, you can make it happen…you just have to get a little creative. My college roommates and I have started a long distance book club. We choose a book once a month, read it and then schedule a time to all video call and talk about it. With other friends, we watch a TV show “together” from different locations and have a group text to discuss the plot twists and our thoughts. At a time when my best friend and I were living states away from each other, and both feeling stuck in a rut, we decided to text daily pictures of things that made us happy. Doing that helped us find the good in our mundane lives and stay connected despite the distance. We live in a day and age with such quick and easy ways to communicate. There is almost no person in the world that you can’t reach out to and get in touch with. Send a text while you’re waiting at the Dr’s office, call a friend while you are folding laundry, send a quick email before you sit down to watch TV, or instead of just ‘liking’ a picture on social media, take a minute to write a comment or send them a private message. If they have confided in you about their struggles–be it miscarriages, job troubles, depression, etc.—don’t shy away from these topics. Acknowledge the hardship and offer to be a listening ear. Most of the time your friends are not wanting you to solve their problems and, let’s face it, you’re probably not the most qualified person to fix it anyway. Just listen and validate that it is hard. AND make sure you keep the confidence. Nothing can ruin a friendship more than a loss of trust. Gossiping has no part in good friendships so keep it between the two of you. Just like in every relationship, friendship is strengthened when you open up and are vulnerable. When you ask a friend for their opinion they can help you see things from a different angle and offer you a new perspective Confiding in and asking your friends for advice demonstrates your humility, trust and confidence in them and will, in turn, tell them they can lean on you. Friendships are often easy to let slip away in the busyness of life. To try and combat this, I have found it requires some small but significant intention. For example, I created a section in my bullet journal dedicated to friendships. I simply list the friends who have been on my mind to call, text, get together with, or serve in some way. As I plan my week I refer back to my friend list and consider specific times I can connect with friends. For example, if I see a friend in passing and say, “We should get together this week.” then later during my planning I see I have extra time on Wednesday afternoon, so I text her and ask if we can go to the zoo then. Even if plans change writing down a name in a certain block of time has helped me be more intentional about strengthening my friendships. Making new friends can often feel a little like the early stages of dating. “I want to be friends with her, but does she want to be friends with me?” “We had a great time at the park yesterday, how long should I wait until I invite her to do something again?” Just like any relationship, friendships can be awkward at first. Don’t expect your interactions to go perfectly smoothly at first. Embrace the awkward and laugh about it everyone feels it. It’s tempting to assume that others can have less than perfect intentions at times, but more often than not we just don’t see the full picture so assume the good and give them the benefit of the doubt. At some point in every friendship, you will learn their not-so-great traits. Choose to focus instead on the ones you admire. Each of us has heard that little voice that says, “I wonder how so-and-so is doing?” “Maybe I should ask so-and-so if I can have her kids over to play?” If that little voice is suggesting for you to do something nice and good, do it. It’s easy to find excuses not attend things that you’re invited to. Believe me, I came up with loads of them in the beginning. You’re not always going to feel excited about the invite, but 9 times out of 10 you’ll be so glad you went. Fight off all those excuses and make a real effort to remove the occasional legitimate ones. You have someone asking to be your friend. Take them up on it. Remember, no one is a perfect friend. And making friends takes time. 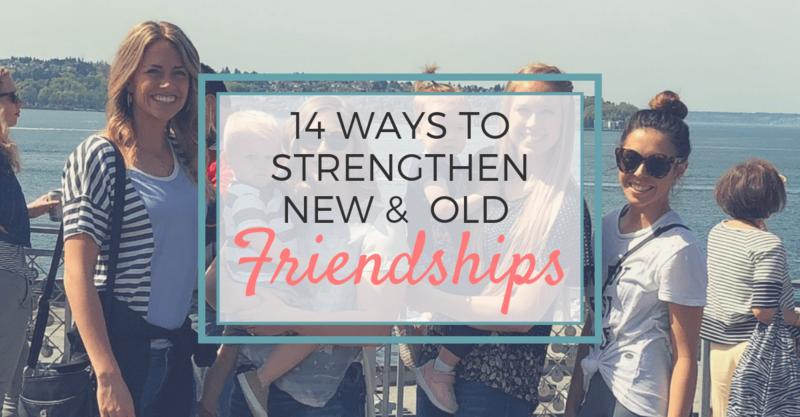 I am happy to report that one year later and through learning and trying to do these 14 simple things, I have found an ever growing and truly lifesaving community of friends. What I have learned is there are two kinds of people in the world: those you love, and those you simply don’t know well enough yet. We, women, need each other. Make the effort to get to know them and you will love them, I promise. Alyse is the proud wife of her husband Joe and mom to their 18-month-old son. She is an avid football fan, has a passion for dejunking and organizing and dreams of one day being the Joanna Gaines of the Pacific Northwest. Call, text or email a friend letting her know you appreciate her friendship and support. What are your best tips for keeping friendships strong? Sharing is Caring. Like, Share or Pin for later.